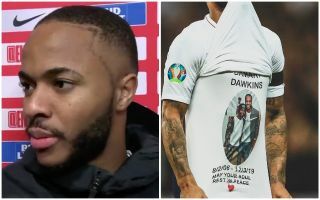 Raheem Sterling bagged a hat-trick in England’s 5-0 win over Czech Republic on Friday night, and dedicated one of his goals to Damary Dawkins. The Manchester City forward has been in fine form for Pep Guardiola’s side so far this season, and he took that into the international break with a star performance to kick-start England’s Euro 2020 qualifying campaign with a comprehensive win. However, as seen in the image below, Sterling paid tribute to Dawkins after scoring his second of the night, lifting his shirt to reveal a special message for the young lad. Dawkins was diagnosed with Acute Lymphoblastic Leukaemia and died on Sunday after Sterling had joined the campaign to find a donor for him. Sadly, that didn’t work out and as explained in his post-match interview with ITV as seen below, the 24-year-old conceded that he did it for the youngster’s family to show his respects. It’s another sign of Sterling’s class, as he continues to shine on and off the pitch on what was undoubtedly a poignant night for him despite leading Gareth Southgate’s side to an impressive victory.
? Damary Dawkins was diagnosed with Acute Lymphoblastic Leukaemia & passed away on Sunday.
? …and visited him in a hospital in London on a day off.